Only 92 lbs. left in stock! This is a wonderful Panama Coffee form 3rd generation coffee producers, Maria and Plinio Ruiz. Natural shade trees not only provide cover for the coffee plants, but food and shelter for migratory and resident bird species. 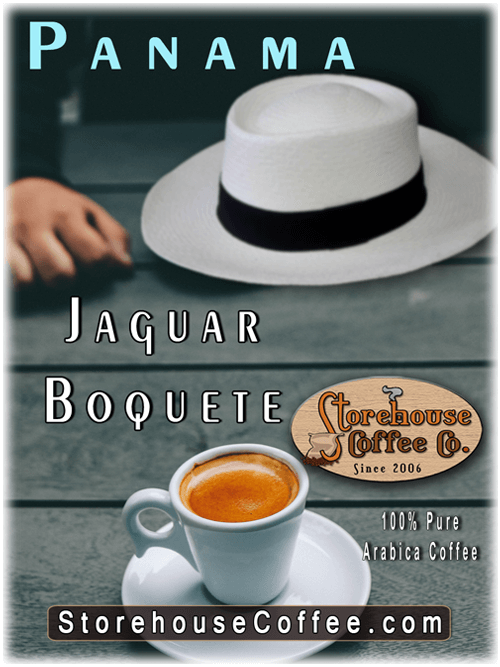 The mineral rich volcanic soil, and weather conditions are ideal for producing this excellent Panama Jaguar Boquete. The aroma offers a warm nuttiness and floral notes of vanilla and caramel. The mouth-feel is round and silky, with a sweet finish. Whichever Roast Level you choose, you will be left with a smooth, well rounded, and satisfying experience. My favorite roast level is Full City for the best balance between body, acidity, and roast, but Full City (+) is very nice as well. High citrus notes, raw sugar, and roasted nuts will dominate the profile. The body will be lighter, but with soft and sweet hints of chocolate and a crisp finish. This is my favorite roast level, and where I found that warm, yummy sweet-spot. This roast offers a full body with a smooth, creamy mouth feel, with milk chocolate highlighted by notes of orange on the upper palate and sweet, brown sugar finish. Amazing! Our Full City (+) roast will provide a more silky mouth-feel and syrupy body, with notes of dark chocolate and hints of raisins. The acidity will be tempered yet you will still find the notes of orange highlighting the smooth, sweet finish. This roast will provide a deeper, and juicier body with darker, bittersweet chocolate notes and a kind of jammy sweetness. The finish will be more pointed and lingering. Casa Ruiz is operated by brother and sister, Plinio and Maria Ruiz. Like their parents and grandparents before them, they are completely dedicated to growing top-quality varietals in the cool, natural shade canopy of the Boquete Mountains, and have earned a reputation for quality, and consistency. The Panama Jaguar Boquete is grown from an assortment of arabica trees, including Pacamara, Geisha, Catuai, Typica, Yellow Bourbon and Maragogype. The farm employs a permanent staff of 74 workers, and during harvest, nearly 900. The quality standards ensure that only the ripest, red cherries are picked, processed, and sorted by growing method, altitude, varietal, and bean size. Plinio and Maria support social sustainability and empowerment initiatives, including local literacy and professional development programs, the teaching of technical aspects of organic farming, coffee industry education and even barista training. Elevation: 4,900 - 5,400 ft. Loved this at the full city plus roast level. Description was spot on and worked well as a pour over or espresso! Try it! I can't decide which I like better - the Costa Rican or the Panamanian. Both are excellent with the lighter roast, too. Thanks for the recommendation of the beans from Panama! Reviewed by: M from IL. I followed Joe’ advice and he succeeded in helping me finally find a Central American coffee I like. I’m a staunch full body dark roast Indonesian and African coffee guy without the citrus and fruity undertones. This Panamanian coffee is outstanding with noticeable chocolate nuance. I like the full city plus roast level that leaves a nice oily sheen. Can’t go wrong with this one folks! Reviewed by: Chuck Barr from Richardson. I just wanted to let you know how much we are enjoying the Panama Boquete. Its a fabulous brew, very aromatic and consistently flavorful. Thank you for continuing to turn out great coffees! It is a real treat to be among your clientele. I got mine roasted at Full City (+) and boy it is ever juicy and sweet. I pick up some nutty almond too. Reviewed by: Mike from MA.